I was having a wet Sunday afternoon organising my photos when I came across a Greek set which I couldn't find any clue as to where they were. Then I remembered there was a draft post lurking somewhere which identified where we had been. So here is a post from Spring 2005 when we were still living in Athens, and I had just started my blog. Arcadia seemed such a nice place to make a trip to. I wasn't sure why and I only just now looked up what I had at the back of my mind: et in arcadia ego. It seems it's an inscription on a tombstone, implying that the person too once enjoyed the pleasures of life on earth. So somehow Arcadia is the place to go for the pleasures in life. Anyway Bee needed a field trip for her history class (after the failure of the Jewish Museum in Vienna) and I needed a Sunday outing for Easter. Bee hates outings to see old bits of rock (as she put it), though she loves history. We both needed a Sunday lunch by the sea. A chance article in Saturday's Kathimerini about turning the Roman villa of Herod Atticus into a museum gave a direction. Neither of us knew where Kynouria was, but a map revealed it had enough sights for it not to matter if one was a dud. So we set off late (forgot to adjust our clocks) with road map, Rough Guide to Greece, and various printouts from the internet to tell us what to look for. According to our own theory of travel (still to be written down) nothing you read before going makes any sense till you see it, and by then you have forgotten what you read. By the time you get back you have forgotten what you saw but what you read then can at least bring back memories. This is taken to mean that you should forget guide books and follow your nose for what is interesting at the time. 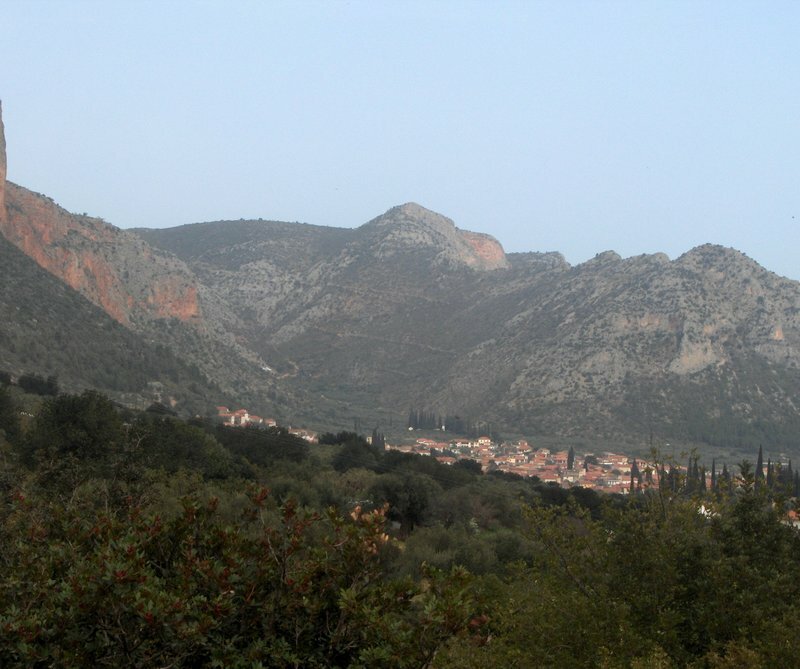 After an hour or so down the motorway to Corinth and a drive though orange groves to Argos, we moved into the prefecture of Arcadia and Northern Kynouria. The Rough Guide claimed the villages were very tidy, in itself worth a visit in Greece, and so they were. Not much concrete or building in evidence and well maintained traditional houses, the older ones made of stone. A detour took us to the Archaeological Museum. This was a very smart building with high ceilings in a lovely walled garden, obviously well cared for. The museum itself was as described on the web, a few local treasures (coins, vases, statues with bits missing) but disappointing to Bee as the curator would allow no photos or sketches. So we came, we saw but we could not take away. Even the headless reclining ladies in the gardens were to be protected from us. We had to content ourselves with photos of the car park, the outside of the museum and a nearby building which took my fancy. The museum did contain some photos and explanations of the mosaics in Herod’s villa, but they were clearly elsewhere for even more safe keeping. Then off we went to find the original, up the hill to Eva alias Kato Doliana on the map. In a spot with a good view, but not of the sea, we found the villa, fenced off in a desultory way. Nothing at the site to explain what there was, or what had been taken away, so we were not much wiser, except it was a rather big house. to Kathimerini, but this must include the grounds. Compared with the average Athens apartment of less than 100 sq m or even 3000 sq m for a large house for an embassy type, this was very big. It contains remarkable collections that reveal the history of Herod himself, who dreamed of a happy home filled with original works of ancient Greek art and Roman copies of ancient works. But he succumbed to depression when his wife Rigilla died, children and pupils died, and turned the luxurious villa into a museum and site for the mystical worship of his dead”. Built in around 117-138 AD, when misfortune struck in 165 AD, the villa was clad in marble from Lesvos, turning it into a mausoleum. No sign of any marble now and one wonders why he brought marble all the way from Lesvos. The heart of the villa was a rectangular courtyard with a garden surrounded by an artificial stream. It was framed on three sides by arcades and corridors with superb mosaic floors in the atrium, and on the fourth side by an exedra or platform. To the west is a small basilica, and on the south side an octagonal sentry post, baths, a semicircular Nymphaion and another basilica (a temple to Antinoos) were discovered. To the east is a series of rooms that lead to a courtyard, from which the gardens probably continued. A third basilica is on the northern side, with a library running lengthwise between it and another stoa. The house remained in use till the sixth century. But with no plan at the site, it was hard to begin to discuss the changed use of the word atrium or how the different parts of the house must have been used. The website for the villa has little information but mentions an aqueduct (see later). Afterwards from research we can add that this is the same Herodes Atticus who built the Odeon (open air theatre) near the Acropolis in Athens, which is still used for cultural events all summer and can seat 5000 spectators. Tiberius Claudius Atticus Herodes was a most celebrated orator and Sophist http://www.iep.utm.edu/s/sophists.htm. He was born into an immensely wealthy Athenian family that had received Roman citizenship during the reign of the emperor Claudius. He was befriended by Hadrian and tutored Marcus Aurelius the Emperor of the time. 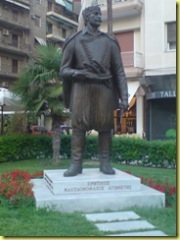 However the depressive version of his life is not mentioned in the standard bibliographies and most refer to his villa at Marathon, where he was born or at Kifissia to the north of Athens. Among the great architectural works with which he adorned the city, we may mention a race-course (stadium) of white Pentelic marble, of which ruins are still extant, and the magnificent theatre of Regilla, with a roof made of cedar-wood. His liberality, however, was not confined to Attica. At Corinth he built a theatre, at Olympia an aqueduct, at Delphi a race-course, and at Thermopylae a hospital ; and he also restored, with his ample means, several decayed towns in various parts of Greece. Trying to find another villa, we found an old bridge which we realised had been an aqueduct. It had been used quite recently but with iron pipes which were still lying there. But the stone walled conduits leading to the bridge were still there as well. The bridge itself had a strange fluid look, but we couldn't get close enough to see why. And the red flowers were pretty. A long and winding road round the coast for an hour past houses perching on the cliffs and tiny beaches nestling at their foot indicated that this was a quite place to escape the crowds but not the Germans, as property boards advertised for them. Bee slept through it all. 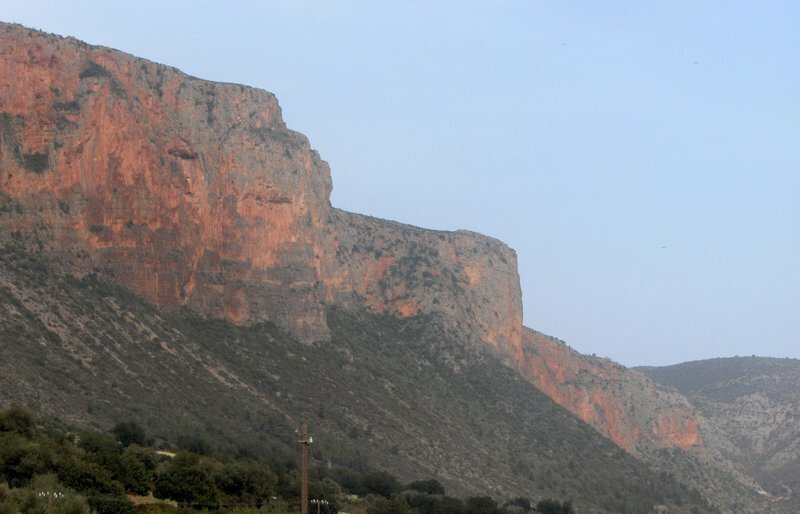 Eventually we reached Leonidio and headed inland looking for red cliffs and a monastery hanging to the rock. Then a long drive on a windy road where the cliffs looked they might descend any moment and great chunks already had judging by bits missing in the cliff and the holes in the road, but no signs of Monastery Elona; at least no signs for it, so we never knew where it was. Then we drove as fast as we could to Plaka, as we were starving. The road took us strangely straight across a wide river bed, with no signs of a bridge. We found a pretty seaside village and packed restaurants. So we bagged a table and rushed to the kitchen to see what was cooking. 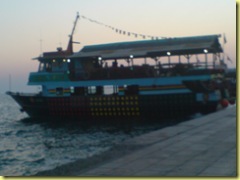 When we had ordered red snapper, baked aubergines, broad beans and artichoke hearts, and the usual Greek salad and tzatsiki we relaxed at a table on the water's edge, happy that it was time to eat outside again. There was a pebbly beach with a fresh water stream, occupied by a group of ducks. Bee christened a group of four white ones the girly ducks, as they went swimming round in a group ignoring the rest. Occasionally one broke away and we laughed as the others played at "don't want to be friends with you". After lunch, we moved upstairs for coffee and Bee wrote her project. In line with the distraction theory of politics, (mentioned in the previous post) the riots in Greece are supposedly a distraction from the Mount Athos scandal. It is claimed that the government could have stopped the riots any time it wanted, but chose not to. I suppose that means shooting a few more people. However it seems strange that the police got to use guns rather than tear gas to disperse the crowd at the beginning. 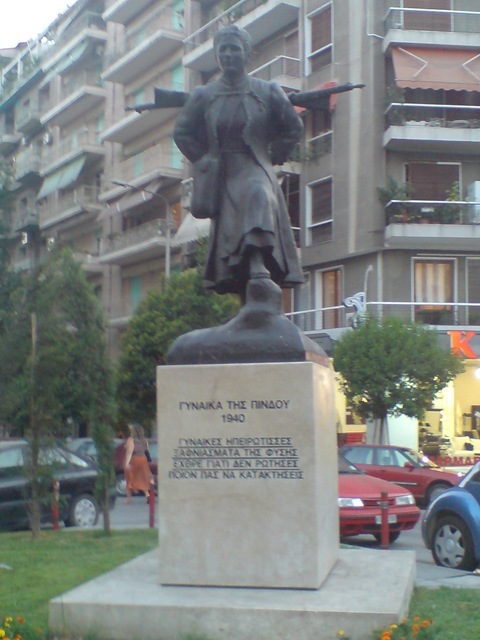 But then I always did feel uncomfortable when I was working in Athens, when I saw young men in teeshirts with kalashnikovs under their arms and starbucks coffee takeaways in their hands, even though despite the fact that they were the police waiting for the annual demonstration on November 17. 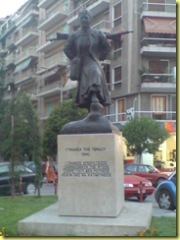 Thank you to everyone reading my posts on Georgia and the war, and those people referring them here. Amazingly there are still people coming to the blog as usual to learn about Greek horta. Well whatever it takes. You are welcome. I always thought fire-walking was a Baltic thing. Michael Palin showed it for either Lithuania or Latvia in his TV tour of the new EU member states. I don't think it added a lot to the general knowledge of life in the Baltics but it was interesting that still people wanted to do it. It's a bit more ambitious than jumping over the Jonines bonfire on the longest day. 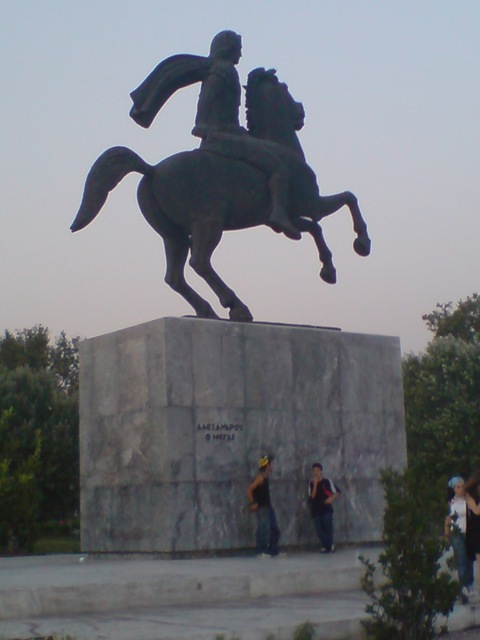 Just north of the ring road (round Thessaloniki) is the small town of Langadhás, which this week comes alive for the feast days of Saints Constantine and Helen. The commemoration of the saintly duo involves a three day frenzy of folk piety, commencing tomorrow with a remarkable display of fire-walking. Dancing on hot coals is a fiery test of faith, yet the pious fire-walkers of Langadhás really seem to survive quite unhurt. You can read a scientific explanation of why it sometimes works for those who believe it here, but it seems it may not work for sceptical scientists. Another interesting fact I discovered trying to find some photos is that there is a firewalking training institution in the US, (in California, where else). Some Lithuanian "graduates" now run their own "school". Their rather attractive website explains how overcoming your fears can be part of successful management training. In the modern world of business companies are in the state of everyday struggle for market share, in the times of increasing global competition every day is a struggle: you either grow or drop, floundering or taking small steps is equal to defeat. Firewalking helped ancient warriors to accumulate determination and energy for victory. We have developed special training programs for teams from business enterprises, operating in an especially competitive environment and facing uncommon challenges. We are ready to pass over the ancient wisdom, which used to be accessible only to the elite and which will help to mobilize the immense inner reserves of every person or a team. Finally for the 3rd time, I have learnt not to write on the weblog and disconnect the internet to save money. It’s possible to do, but not if your ISDN connection crashes your computer like ours does. One more Greek thing I have never got fixed. The weather forecast is predicting snow for the week and the skiers are believing it. So far it has been a very mild winter with only one hard frost, judging by the car windscreen. Last year I ignored the warnings and came back from work in the dark at <?xml:namespace prefix = st1 ns = "urn:schemas-microsoft-com:office:smarttags" />8pm to find 3 inches of snow, the buses had stopped and mobile networks overloaded. I found myself walking in a blizzard with just shoes and a thin coat. Eventually I called out a neighbour to rescue me. There were power cuts and the water froze because I felt guilty leaving the tap running. Everything stopped, though we were lucky as the digger which parks across from our house cleared the road. Later they said that the water consumption in Athens was 3 times normal because of the leaks when pipes thawed and the running taps. As a result there were water shortages everywhere, as they tried to restrict consumption. My friend Jennifer said to stock up with food for the week. Difficult to know what is useful if there is no electricity or water. Settled for matches and torch batteries, plus veggies for soup, a pannetone (reduced after Christmas) and bottled water. Assume the minimarket one minute away will be open as usual for anything else. We have never used the fireplace to see if it works properly so didn’t bother with firelighters and wood. In any case we have a tiny camping gas stove for making hot drinks. We have a power cut once a week with an overload, which means waiting to find a key to grandma who lives in the basement where the reset switch is, so we are well used to this. I guess we can fill the kettle and the bath so we can flush the loo. Then we will be just like the flat in Chernovtsy we stayed in one weekend, where the bath was full of water, so you couldn’t wash, and the place was full of large bottles of water. From that we deduced that that the water was supplied only some hours a day, but we never found a problem ourselves. Parked the car in the worst possible place for snow: my “official” place in the basement of a concrete shell. It’s great for shade in summer and to keep off the rain which always brings with it orange dust (not sure whether it is pollution or sand from the Sahara as the rumours say). But for snow the ramp will be slippery and there are now so many cards parked that the turn out at the top of the ramp will be dangerous in snow. Can’t decide what to do about the plants on the balcony, so end up merely photographing them, to prove they were there, but they are too dark to be useful and it’s too late in the day to take some more. Last year most of them were wiped out. The kumquats are still producing and the bad lemon has suddenly decided to flower, probably to spite the good lemon whose fruit are refusing to go yellow. The weigela is flowering despite no leaves and the hydrangea has lots of leaf buds. The bourgainvillea and geraniums are flowering like summer. The “house plants” are already inside and no room for more, so I don’t know what to do. I don't think the snow materialised. But we did have snow for Christmas Day in Ljubljana. More later. It's official. It's not just me listening to Greek conspiracy theorists about arson being the cause of forest fires. At least, the cause of those regular small forest fires, that clearly got disastrously out of hand this year. In a resolution adopted on Tuesday (4 September), the European Parliament urged the European Commission to provide financial aid to the regions most affected by forest fires this summer with the cost of the damage assessed at some €1.2 to €4 billion. But MEPs also condemned the practice of allowing construction on protected and non-authorised areas, including burnt-down forests, which experts believe motivated arsonists as a way of obtaining new land. 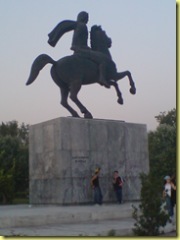 It is estimated that there are around 2 million illegal land holdings in Greece. As the only EU country without a full land registry, it is easier to have burnt land reclassified as farmland and start building on it. "It is a disgrace that property developers should be allowed to take advantage of these disasters by building on former forest land," Swedish Green MEP Carl Schlyter commented. "It is important that the EU should assist member states affected by these disasters, however it is equally important that those member states in receipt of EU aid ensure that the funds are used as intended," he added. Earlier the article points out that Greece has had EU money to implement a land registry but didn't bother to do it, so was forced to return the money. Probably the property developers prefer the arson method as it gives them more freedom. Boring to have a legal system making it clear who owns what, and having boundaries marked on plans. Better to have no plans and destroy the natural features marking the boundaries. Really I have no sympathy for Greece, but I do feel for the home owners who lost everything. CNN last night was busy discussing the motives behind the arsonists who are now being blamed for the forest fires, as if they were just madmen. I was amazed. I'm sorry to be cynical but forest fires have been a regular feature of summer in Greece. Whilst the dry weather and the August meltemi wind obviously play a part, but there are other factors at work, as you can see from this post I made when we were still living in Athens. Fires round Athens were always claimed to be started by arsonists paid by developers who wanted to clear land for building. It was hard for them to get planning permission in some areas, so a bit of forest clearing could produce more land. Although the government was always promising that building would not be allowed and trees would be replaces, somehow it has never happened. Clearly forest fires on the scale of those shown on the satellite photos cannot all be caused by arson, or at least were not intended on that scale and have gone badly astray. But the result will probably be the same in the areas where land for building is in short supply. This is what passed for my summer holiday, at the end of July, though I was really working, before we went to Belgrade. 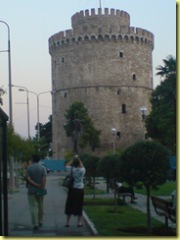 Didn't do much better with the photos in Thessaloniki either. 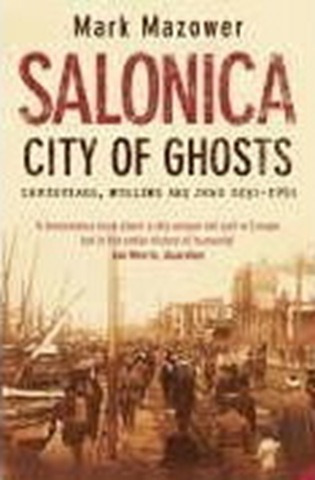 For its history Salonica, by Mark Mazower, is excellent. He traces its fascinating cosmopolitan life with Christians, Muslims and Jews, which ended with the Second World War. 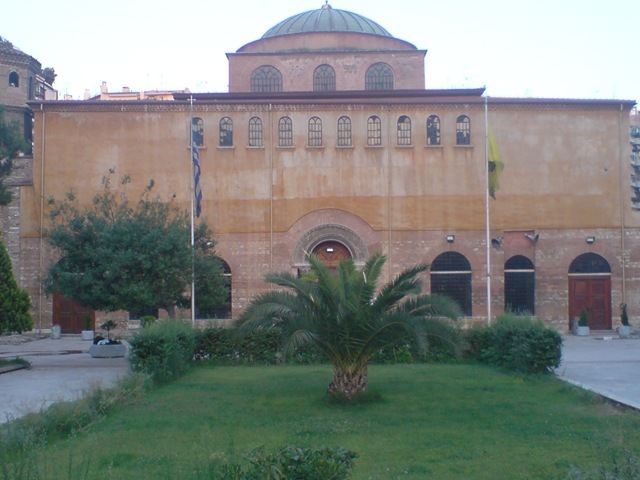 It is now a largely Greek Orthodox city, in more ways than just religion. Since the war and its repopulation with Greeks, it has become much like other Greek cities with huge areas of concrete blocks of flats. In fact, on her first visit, Bee dismissed it as yet another Eastern European city. In the main square, we snapped these pigeons, reduced by the heatwave to sitting in the shadow of a lamp post in the main square. No frappe for them. 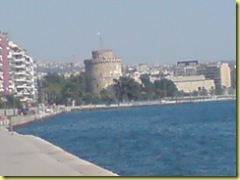 Here are some pictures of the White Tower, one of the few historical sights left, a statue of Alexander the Great (that well-known Macedonian) and a rather different Aghia Sophia. 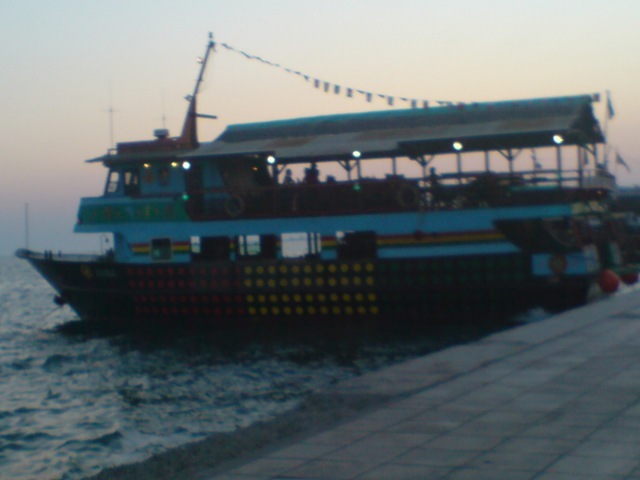 The boats which tour the bay in the evening, and Macedonian heroes and gun carrying heroines. The war casts a long shadow, still. We went to Toroni at the weekend: a quiet village in the middle prong of Halkidiki populated only by a few Greek holiday makers and us. Absolute bliss. Not too hot (around 35 not 40), good food, free sunbed and umbrella if you bought a drink in the cafe; and perfect beach: sand with a slow dip into the sea. My balance is bad on pebbles and rocks so I hate that wobble into the sea that I usually get. Thoroughly recommended. 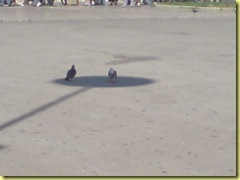 There seems to be a competition on the Kyiv blogs about how hot it has got. 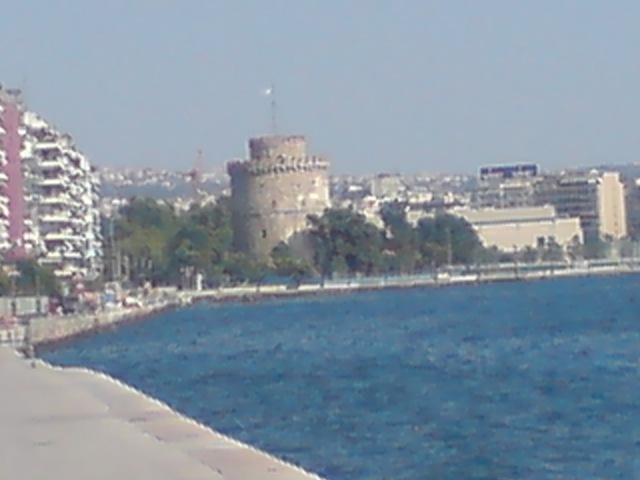 Since I can't join in this summer, I can only say that as we came back from dinner this evening in Saloniki, walking by the sea, where you'd think it would be cooler, we noticed that the temperature was still 36 at 10.30 at night. Over on Enidd, there has been much discussion about hairdressers, good, bad and indifferent. It seems everybody finds it difficult to get their hair done as they would like it, for a price that seems reasonable, without being made to feel that the salon was too good for them. It seems I must tell you about our Greek hairdresser. We had lots of Eastern European experience, where the only thing you could say in favour was that it was cheap and at least you could see again under your fringe. The only style I could ever get was Dusty Springfield bouffant and kiss curls, or in Lithuania a style I associated with a woman politician whose values I did not admire (a bit like Margaret Thatcher). Then we found our Greek salon. For some reason, it was situated in Maroussi, the northern suburb of Athens where we lived, although the prices they charged were surely centre of Athens. We didn't mind that, since it saved a one hour hot and smelly journey on the train to get to the centre. It was populated by three gay guys plus a woman manageress who tried to keep the peace. The first guy was the colourist but also the communicator. He spoke excellent English and had a thorough knowledge of London, probably better than mine these days. He obviously went there often, for shopping, as he put it, though this might well have had a wider range than usual. After successful colouring, you were taken downstairs for a cut. The choice was between an older rather hunchbacked and shifty character or (when we there) a transient French guy. The choice was not made by you, since hunchback was a rather jealous and fickle sort. If you were booked in with the French, suddenly space would appear in the hunchback's appointments and he would ask how you liked your cut last time and should he do it again. Even if you accepted the inevitable and were booked in with the hunchback he might suddenly decide to steal other customers from the French guy and make you wait. Since neither the hunchback or the French guy spoke much English, it was hard to work out exactly what was going on. The French guy didn't seem to speak much Greek either. The scope for misunderstanding, was huge, deliberate or not. The manageress had to spend a lot of time soothing tempers and decreasing the volume of shouting that always occurs with disagreements in Greece. After one particularly long wait, where sulks seemed to have set in all round, I explained to the manageress that we actually came for the theatre as much as the hairdressing. She looked at me blankly until the penny dropped. You may ask why we accepted all this. The three of us agreed that we always came out looking much better than when we went in, our hair was more or less how we wanted, we had been pampered, and we had enjoyed the floor show. What more could you want! Want more of Wu Wei?